Quality Australian drama movies are a dime a dozen, however memorable Australian drama movies are something entirely different and The Ten Empty falls into this category. The story revolves around a family who lost their mother after a history of mental illness. Elliot (Daniel Frederikson) left his family home and ventured towards Sydney, whereas his father Ross (Geoff Morrell) married his mother's sister Diane (Lucy Bell). His younger brother Brett (Tom Budge) was left devastated from these string of events and withdrew into his own mind, similar to that of his mother. When Elliot returns after ten years later, emotions skyrocket between Elliot and his father with Brett left in the background and his mental health worsening. The relationship between Elliot and Ross is quite disheartening at times, whereas Diane is the suffering wife who silently waits in the shadows, much similar to that of Brett himself. The director brilliantly highlights the flaws of humanity and that of the family unit in this gripping tale of emotions, guilt and conclusions. 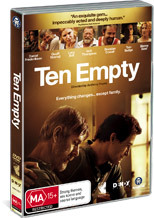 Even the dialogue of the Ten Empty is quite realistic at times and showcases some of the flaws of society and the widening gap between the family of yesterday and the family of today. Featuring 16:9 widescreen, the images are quite sharp in the Ten Empty, however the colour palette does feel a little muted at times. For lovers of special features, the DVD contains an interesting documentary regarding the making of the movie plus interviews with Anthony Hayes & Brendan Cowell. Lastly it contains a great commentary by both Hayes and Cowell with a short film by Anthong Hayes. Definitely one of the better Australia drama movies.